Hinata no Aoshigure is a wonderful little short film from the director of the award winning Fumiko no Kokuhaku that is worth your time. The short has us following Hinata as he literally fumbles with his feelings for his classmate, Shigure who is fond of birds. Hinata uses his experiences in real life to fuel his imagination, turning mundane tasks and places into locations and scenes of wonder and childlike excitement. A great example of this is the school pet bird's cage turning into a large greenhouse bird sanctuary in his mind. The surface story of loving someone and having trouble directly revealing this to the person in question is nothing new, Hinata's imagination however turns such a dull topic into something fantastical, making it more pleasant to follow. This is where the short really shines. Studio Colorido follows up on the Hinata's visions of the story unfolding with bright crayon-like colors and an art-style to match. The images evoked during the imagination scenes are simply beautiful and the most memorable part of the short for sure. The uses of CG, while obvious, did not feel out of place and managed to blend in enough without becoming too distracting. When the story hits its more somber points, Studio Colorido was not afraid to darken things to set the tone, and the contrast of these scenes compared to the blissful ones does its job well. The art is what makes this short truly worth a watch. The soundtrack does an excellent job of setting the mood and really helps raise up the last segment of the film. While it is nothing I would think about revisiting again without context of the scenes to back it up, it is playful and uplifting and definitely had me reacting to it. With so few lines, they manage to characterize Hinata very well throughout the film. This clumsy dork is hard not to like, and the use of facial expressions honestly trumps any dialogue spoken in the film. Shigure talks more than Hinata and yet it felt like she lacked more substance than Hinata. I didn't grow to care for her nearly as much as I did Hinata, and her ending lines really fell flat on evoking emotion. Overall I enjoyed Hinata no Aoshigure, and am I glad I was recommended to watch it. It hit all the right notes when it comes to music and art to make a fantastic viewing experience. While the story wasn't very inspired, audio and visuals are such a key component to animation, I can't really complain if it didn't detract from my enjoyment much. With such a short running time, I would suggest giving it a shot, especially if you enjoyed the director's previous work. I look forward to his future endeavors within the industry. I had never even expected to watch this, but I sure am glad that I did. I remember watching a short trailer for this a number of years ago but ended up forgetting about it until just yesterday. This little gem is from Hiroyasu Ishida, the same creator of "Fumiko no Kokuhaku," and given his impressive list of works "Hinata no Aoshigure" is sure to live up to the fantastical, magical worlds he transports viewers to. The story is quite simple. Our young protagonist Hinata is an elementary school student with quite the overactive imagination, is very skilled in drawing, and is incredibly socially awkward. He befriends his classmate Shigure, and they slowly open up to each other in their fondness for birds. But of course, Shigure has to move away soon due to her father's work, and our bumbling hero Hinata goes on an epic quest to the train station to tell her how he feels before she leaves. Pretty standard romantic fare right? It would be, if it wasn't for the vibrant world "Hinata no Aoshigure" shows off. 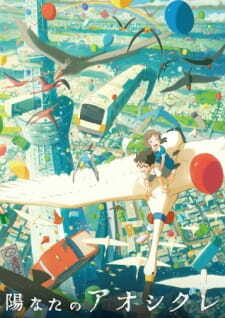 Playing on Hinata's vivid imagination and skill in drawing, the movie constantly switches from boring everyday life to the same scene re-imagined in Hinata's wondrous painted worlds. Hinata enjoys placing himself in fantastical situations with Shigure, such as turning their short exchanges into adventures in a wildlife sanctuary for birds. The most incredible imagery comes from Hinata's attempts to chase after the taxi Shigure is in, his bicycle turned into a flying bird and the taxi chase replaced with him soaring through the skies. One of the biggest highlights of this movie is the gorgeous visuals. The whole movie looks like it came straight out of a children's picture book. Lines are very crisp and there's a watercolor-like quality to the animation and colors used. Speaking of which, the use of color in this movie is stunning. Color contrast is bold and noticeable, bright greens when Hinata is happy to deep shades of blue when the crushing realization that Shigure would be moving away is just one of the many examples found. The taxi chase scene is particularly noteworthy, and all sorts of color just seem to burst from Hinata's imagination. The overall movie gave me a very Disney or Pixar sort of feel. It's hard to describe, but this movie could easily have been one of those short animation projects shown before the main feature, something to wet your appetite beforehand. Oddly enough, this movie also reminded me a lot of "5 Centimeters per Second," anime's quintessential romance movie. Both share in the protagonists's earnest journey to confess their feelings, and both movies have made me afraid of trains. They even share a similar message right at the train station, but while the future in "5 Centimeters per Second" was a lot less cheery, I'd like to think Hinata and Shigure would meet again happily in the future. "Hinata no Aoshigure" is whimsical, clever and definitely packs into it a lot of love. It's a magical, colorful journey and it's easy to see a lot of care went into crafting this story. Clocking in at a little under 18 minutes, it's definitely worth a try. I feel like watching this made me feel just like an earnest little kid again, and that's a feeling that many full length series can't capture as well as this charming gem of a movie. And with that, it's time to leave. Trains don't wait for every little thing. The train doors are closing, and I bid you "Good luck!" "What happened." ~ Me at the end this short film. I walked into this with high hopes and with the first act of the movie shaping up to be something amazing that soared even higher. Once the final arc of the short film kicked in I was speechless. I literally had no words to describe what was occurring on my screen. Well let me save this for the "enjoyment" section. We, the viewers, follow Hinata, I think, as he tries to confess his love to his crush, Shigure. It's simple but it works. I kind of was confused why the movie was switching from a grounded style to a metaphorical style like it was something to be proud of. I think it removes the realism the first half of the short film tries to portray. The ending is such a missed opportunity that if given this project I would have done things different from the half way point onwards. If you found this emotionally impacting I am happy that you did, but I for one could not find it this way. SIDE NOTE: The very end makes it seem like their encounter was sort in his head which would make the second half lose all of its problems, but sadly they never directly tell the viewer if this is true or not. If I am wrong about this then this short film would easily be a solid 7 or an 8. This is easily the strongest part about the whole experience. Unlike the story that is being told the animation and the music stay consistently good for the most part. This short has a Ghibli/Disney feel, just like what most of what Studio Colorido has done in the past. The art and animation are extremely fluid and expressive for the duration of the film. You could say that it was as fluid as riding a canoe down the Colorado River and when you were riding this canoe a tree branch known as the plot knocks you off making you drown. Sure the water known as the presentation was a joy to the eye, but the story it was telling was no where near the quality of the water. One thing of note is that the CG Train didn't look bad and I must thank the people at ColorDorito for a pretty train instead of a poop one you would usually get in modern day animation. We have a main male character who is very easy to relate with and get behind. We have his crush, Shigure, whose past is shrouded in mystery. This movie is short and skims over their relationship because of the duration of the experience. I guess they were good for what we got. I shall end this by saying that this was easily one of the biggest disappointments I've had the displeasure of viewing in a long while. The movie may look good but the story was so detached from any reality that I thought the main character was going to told to pick a pill at the end of the movie. The one I would have picked was to change the ending of this movie. I detest this for squandering its potential and making it something worthy of my hatred after such a strong start. I wouldn't give this movie a recommendation unless you wanted to watch a spectacle in which I could point you to other movies and series that do this much better. For other things to watch besides this that are of the same vain, 5 Centimeters per Second; a love story that acts more closely to the first half of this than the second half, and The Wind Rises, a Ghibli film in which it kind of feels parts of this were cut and pasted from this movie because of how breathtaking some of the shots are. TL;DR A wasted idea with good production to back it up. Pass and go watch something better. Ok this short was aired on 2013 and I'm just doing the review now. I found this anime by a gif and I decided to check it out, and boy that was a good decision. This anime is really short, only 17 minutes long, so you can watch it on your free time. This was an enjoyable anime for just being 17 min long.